Before there were boats, there were movies in the life of Reuben Trane, the president of Miami-based boatbuilder Island Pilot. But instead of taking the stage on Oscar night, Trane became a celebrity in the marine industry, known for his willingness to bust the mold of convention. One editorial even called him a "mad scientist sort of guy." The moniker could be the result of his latest creation, the DSe Hybrid, a unique 40-foot power catamaran that uses solar and diesel-electric propulsion technologies. 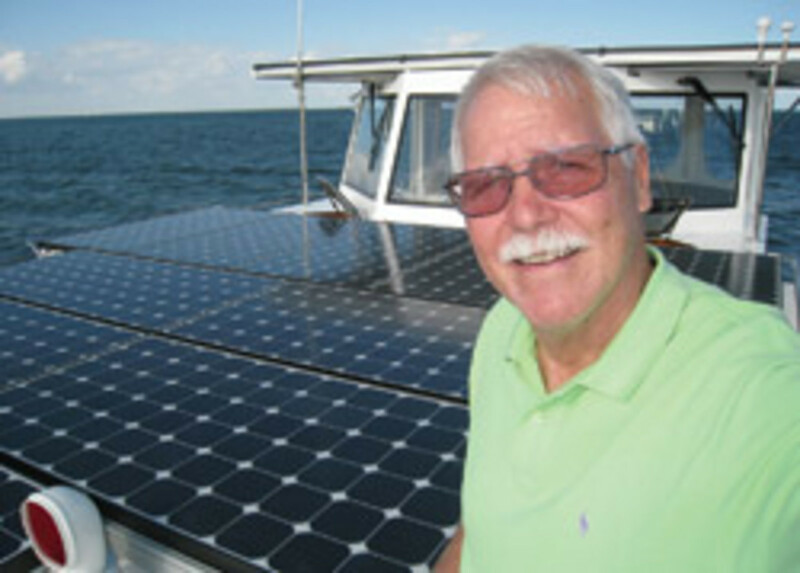 How did this former sailboat builder evolve into a leading industry advocate for green powerboat technology? It started in 1980, when Trane switched from making movies to building sailboats designed for shallow-water cruising, the so-called Florida Bay Hens. "I always loved Phil Bolger&apos;s designs because they offer the biggest bang for the buck," Trane says. "At that time I had a small shop in Miami, and my late wife and I talked about building liveaboard power cruisers." That led to the Florida Bay Coasters, tramp steamer-inspired trawlers of 45 to 65 feet for which Trane enlisted designer Jay Benford. In fact, singer-songwriter Billy Joel owned one named Red Head. But that did not satisfy Trane&apos;s ambition and curiosity for engineering, which he&apos;d inherited from his grandfather Reuben Nicholas Trane. Trane&apos;s grandfather and great-grandfather, James Trane, co-founded the Trane Company in 1913 to develop advanced heating and air conditioning systems. (The Trane brand still exists as a subsidiary of Ingersoll Rand). In the early 1990s, Trane co-founded Krogen Express Yachts with James Krogen and Krogen&apos;s son, Kurt, to build fast commuter-style yachts in Taiwan. When James Krogen died in 1994, Trane sold his interest in the company to Kurt and struck out on his own in 2004 with the Island Pilot, a so-called "crossover" trawler designed for speeds in excess of 30 knots, far beyond the norm for that genre. "People wanted to have a faster trawler, so why not make it a real fast trawler," Trane says. That&apos;s how the Island Pilot 395 with twin Duo Prop 350-hp Volvo Penta sterndrives came about, which turned into the company&apos;s "bread-and-butter model." Its successor, the IP 435, is equipped with Volvo Penta IPS 600 pod drives for better performance and fuel efficiency. In 2006, when fuel prices began their climb toward record heights, Trane started fishing for solutions. He went far outside the box with a hybrid cruising powerboat that incorporated renewable energy for propulsion. "I wanted to make the most fuel-efficient boat I possibly could," he says. The $600,000 DSe Hybrid rides a George Petrie-designed hull that&apos;s optimized for low drag, which makes low-power propulsion work. A 6-kW photovoltaic system that covers nearly 200 square feet topside powers the electric drives for a top speed of about 6 knots in calm water. Published performance data reports a range of nearly 25 nautical miles in electric mode at 3.9 knots. "It&apos;s great for puttering around in the Bahamas, hopping from cove to cove, and living the good life on the hook," says Trane. 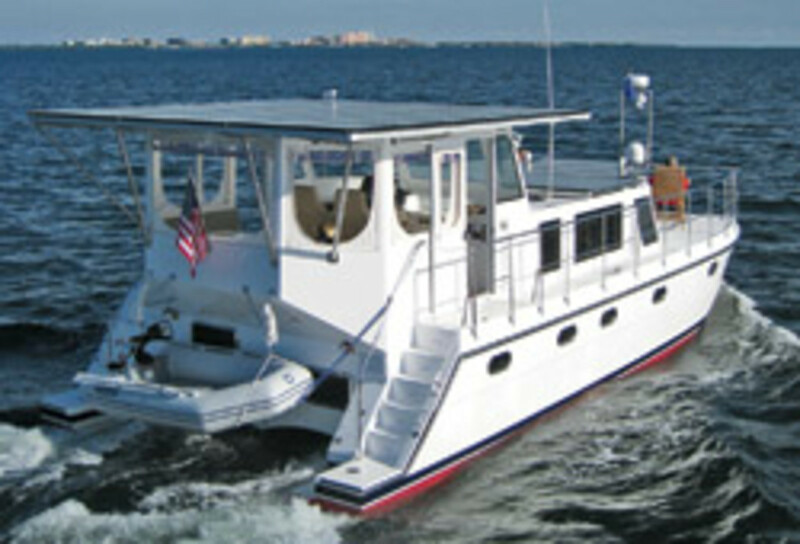 At anchor, solar energy charges the boat&apos;s battery bank, which then powers such amenities as AC, a washer, water heater and entertainment system without running the generators. Going longer or faster, such as crossing the Gulf Stream from Florida to Bimini, requires the services of two 75-hp Steyr hybrid power plants and ZF Marine Saildrives that offer conventional diesel propulsion for top-end speed. The "green" vessel also incorporates two 7-kW 48-volt DC motor/5-kW generators, which can be used for quiet cruising and slow-speed maneuvering and for charging duties. Cruising speed in diesel mode, according to Trane, is around 7 knots, burning about 2 gallons per hour. But with this many bells and whistles, the DSe Hybrid isn&apos;t exactly an example of the keep-it-simple approach. "Is it complex? Yes, but [the complexity is] managed &apos;behind the curtain,&apos; " Trane explains. "Solar is passive and has no moving parts; chargers and inverters have been around for a long time. There is not a lot to go kaput. Plus you have propulsion redundancy with two diesels and two electric drives. And if something breaks down, you&apos;d call a mechanic, just as you would with a diesel engine that&apos;s too complex for a layman to fix." Trane and his engineers in Zhuhai City, China, where the DSe Hybrid is built, continue to work on refinements - switching from AGM batteries to lighter and more powerful lithium technology, for example, to increase capacity and reduce energy loss that&apos;s associated with charging and discharging. Trane remains confident that the DSe hybrid will be popular with the target audience, especially once the economy recovers and demand pushes gas prices back up. But he&apos;s reluctant to predict when that might happen. "I can&apos;t make a prognosis about the market," he says. "When business comes back, it will be different, though. Customers will have to put more money down, and the balance of quality and value will be more important than ever. And the dealer model for expensive boats appears to be dead, as more companies are moving toward direct sales." Trane says his plans for Island Pilot call for integrating sophisticated power management systems into other models, as well. China will remain a manufacturing site for labor-intensive larger boats, but he doesn&apos;t rule out building a leaner and smaller version of the hybrid in the United States if market conditions warrant. "In two years, we&apos;ll have a smaller version of the DSe that runs 100 percent on solar and wind," he says. "I&apos;m going to build something that is fun. My market niche is the retired baby boomer, and that bubble is still coming. I&apos;m optimistic." So the former moviemaker intends to remain on stage for a while. Even though that means that the camera and spotlights will have to follow him around as he continues to explore outside the box.